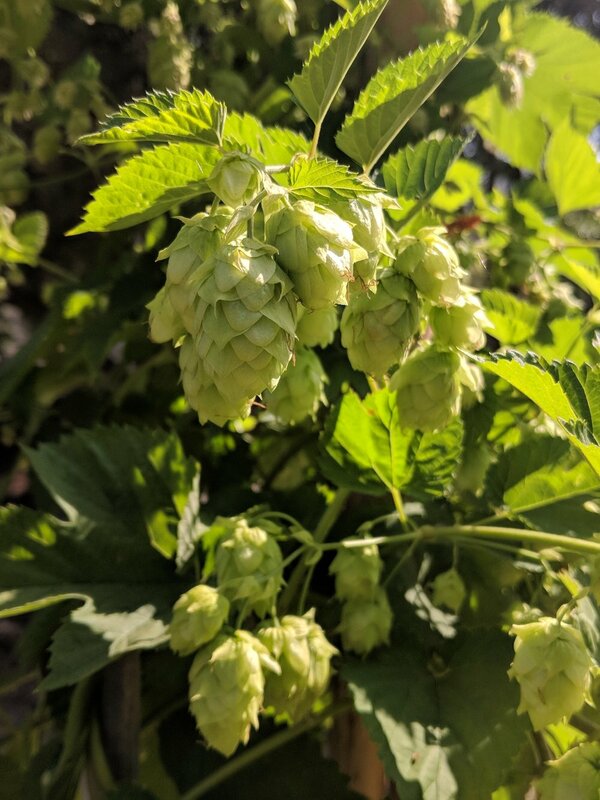 I have been excited since the garden started last year to grow hops and make beer with them. It is a bit harder to do it than I first thought however. 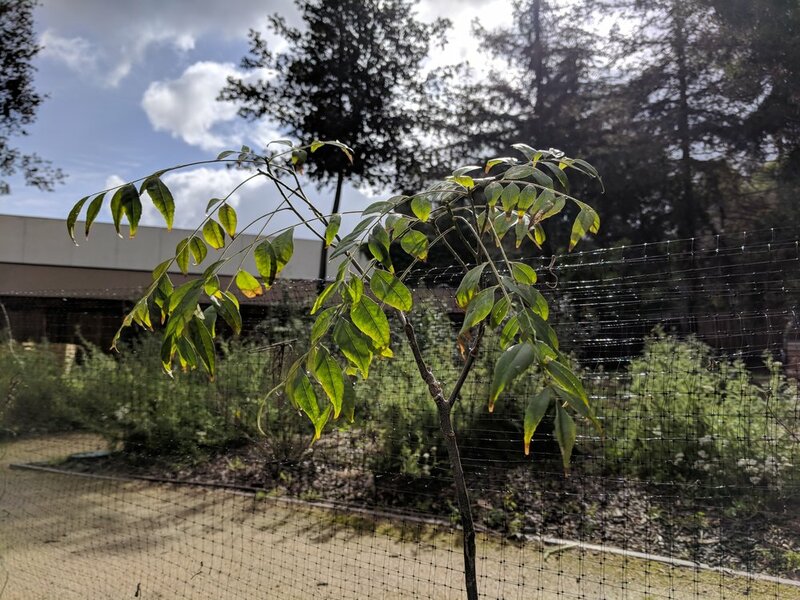 Do I have tall enough trellis space? Will they take over a section of the garden? I had lots of reasons to overthink it but decided to just plant one anyway. I planted a Cascade Hops variety because others report that it grows well in our climate and is easy to grow. Success! This first yield gave me enough hops to do a fresh hops brew! Hops, I learned, are ready when they feel dry if you squish in your hand but bounce back like a pillow. They also leave a strong smell of hops on your fingertips. If they feel moist or dense, they are not ready. 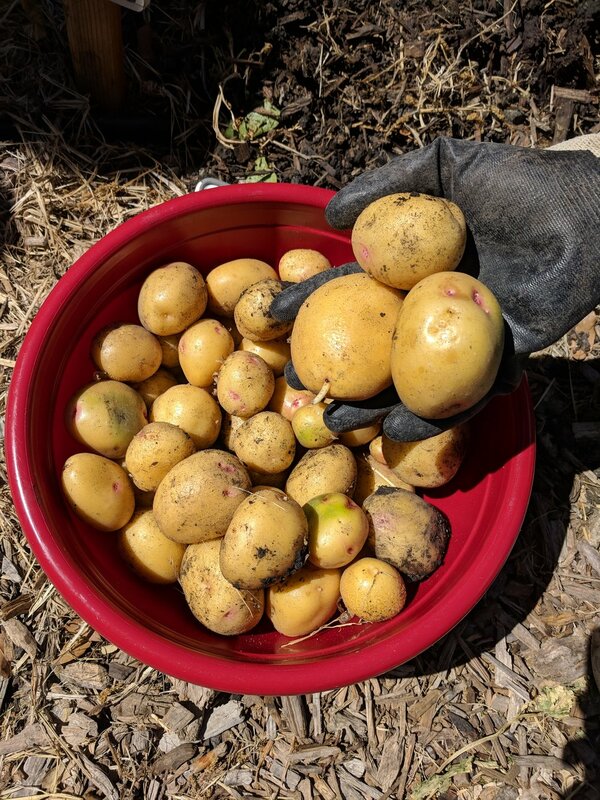 The first half of our harvest became ready early Oct and a second harvest late October early November (which was dried and frozen for later use). To brew with fresh hops, they need to be used soon after picking. The More Beer store in Los Altos gave great recommendations on ways to highlight the fresh hops flavor so hubby and I made an ale using malt rather than extra grains so as not to mask the hops. Add hops. These mesh bags aren’t necessary but make removing the grains/hops easy. Boil. Then remove hops and cool. When cool add yeast and then transfer to 5 gal bucket with CO 2 release valve for 1-2 week primary fermentation. Secondary Fermentation step: Once your beer has been in the bucket for 1-2 weeks, it is ready to bottle. This step is basically to remove as much of the sediment as possible. Beer is siphoned from the primary fermentation bucket into a bottling bucket and then into bottles. Cleanliness is key! Beer is ready about 2 weeks later (the full process takes about 4 weeks from hops to beer). Enjoy! 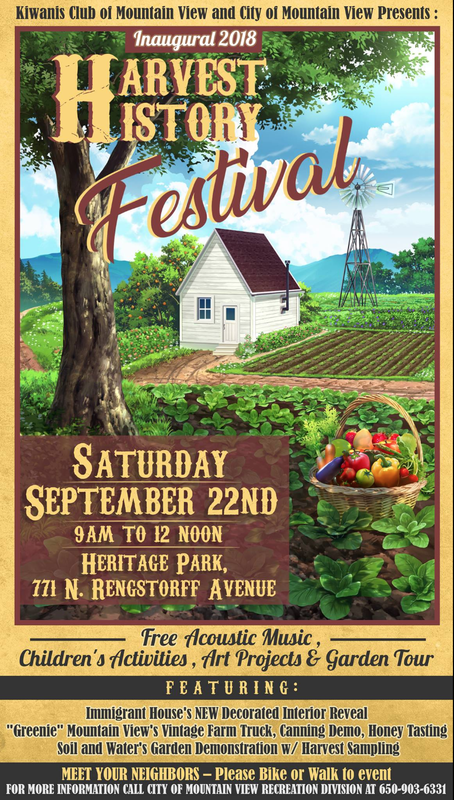 Soil&Water Garden invites you to attend the Mountain View Inaugural Harvest History Festival this Saturday (September 22) from 9-noon at Heritage Park. More information is on Facebook and Eventbrite. 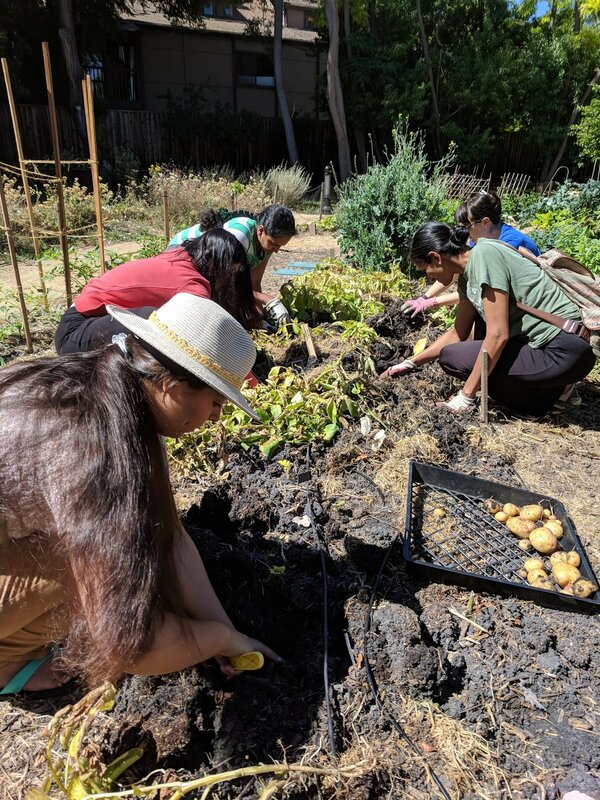 On Saturday, August 18, Soil&Water garden held a cooking demo making and enjoying tamales. A huge thank you to Dulce and Agustina for demonstrating their traditional method for making tamales using the corn leaves (not husks). Everyone attending watched the demo, learned the recipe and then washed their hands to have a try at wrapping these lovelies. Tamales really are a family event; always made in bulk with everyone pitching in to wrap them up. We steamed them right at the garden! During tamale steam time, Jason held Dirt Detectives, a science activity using microscopes and magnifiers for the kids (and adult kids!). Here is the earlier blog post link about that event with a few more pictures below. Some of the things observed under the microscope were corn stems, cabbage leaf cross section, carrot root, sunflower pollen, dandelion fuzz, pine needles and bug parts. You're awesome Jason for putting this together, I loved this about as much as my kids. As part of the scavenger hunt, the kids observed sunflower pollen up close using magnifiers. That is pretty cool but you can also bet that we take every chance to show them how amazing bees are. Once finished, we enjoyed the tamales topped with fresh tomatillo salsa, cotija cheese and sour cream. Minati and Dulce each made salsa using tomatillos and chillies grown at the garden. These tamales were a vegetarian version but can be made any way you prefer to stuff them. They were so good! We've also made it a regular thing to have infused water at most workdays. 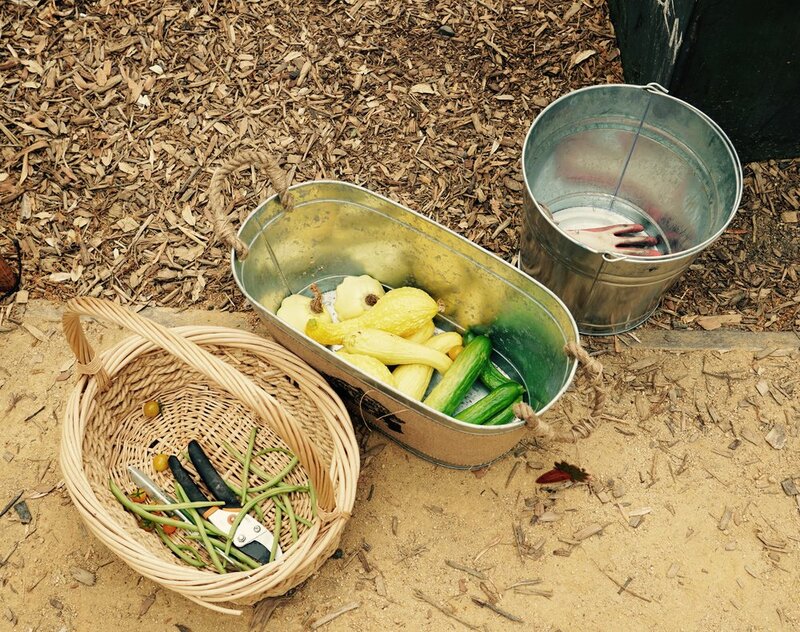 It is easy to use a fresh selection from the garden. This day's selections were cucumber & mint infused water and refreshing hibiscus tea. Thanks everyone for making this event so much fun! It really is what this Soil&Water project is all about.... To bring people together around food and learning. And for those of you interested in growing hops, we are growing them! These cascade hops seems to be doing well. 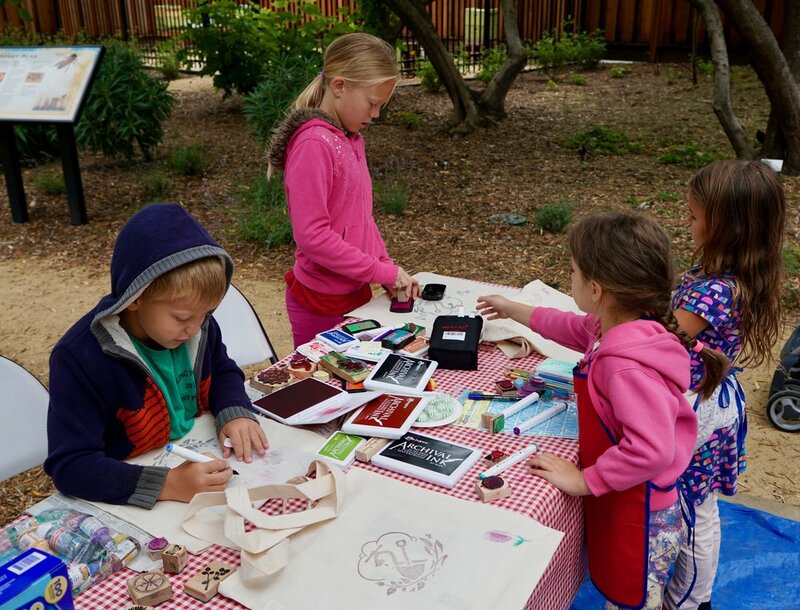 This weekend kids from Mountain View participated in a STEM activity at Soil&Water Garden called Dirt Detectives! The tool shed at Soil&Water Garden was transformed in a Dirt Detectives laboratory! The Dirt Detectives then learned about the parts of a microscope and how to use the power of magnification to observe the plants growing around them. 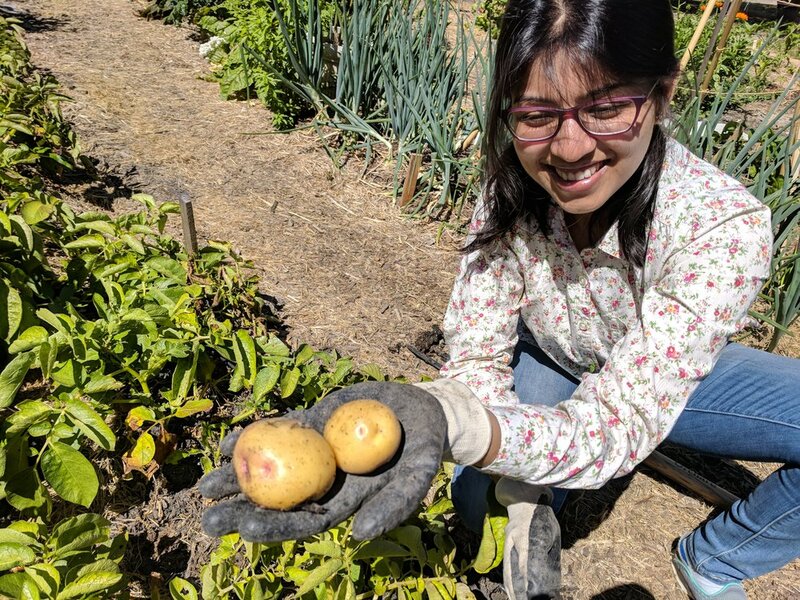 The kids learned how to identify different parts of a plant (epidermis, cells, vascular bundles), and how plants use sunlight, carbon dioxide, and water to create food via photosynthesis. A fun time was had by all. We'll host more kid-friendly STEM events in the future. 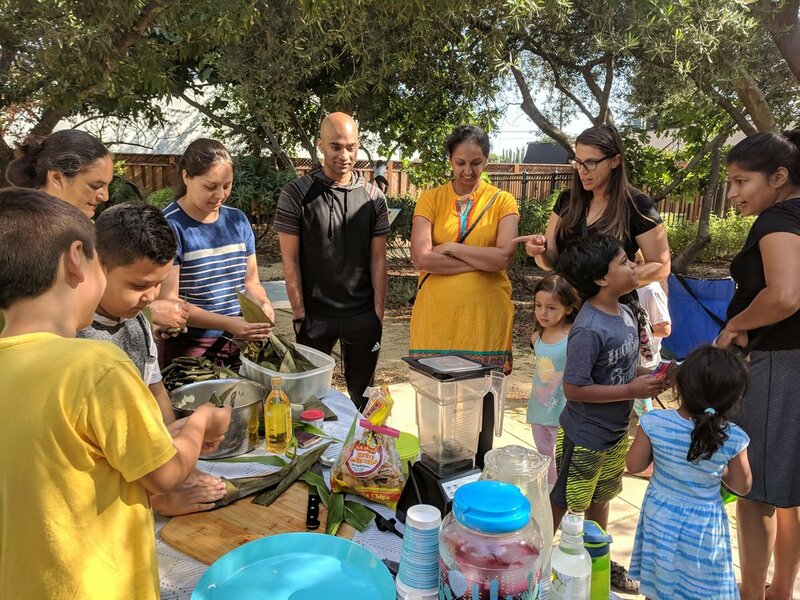 More photos from the event in our Tamales and Microscopes album on Google Photos. Garden STEM activity for kids: Dirt Detectives! Explore Soil&Water Garden through the lens of a microscope. 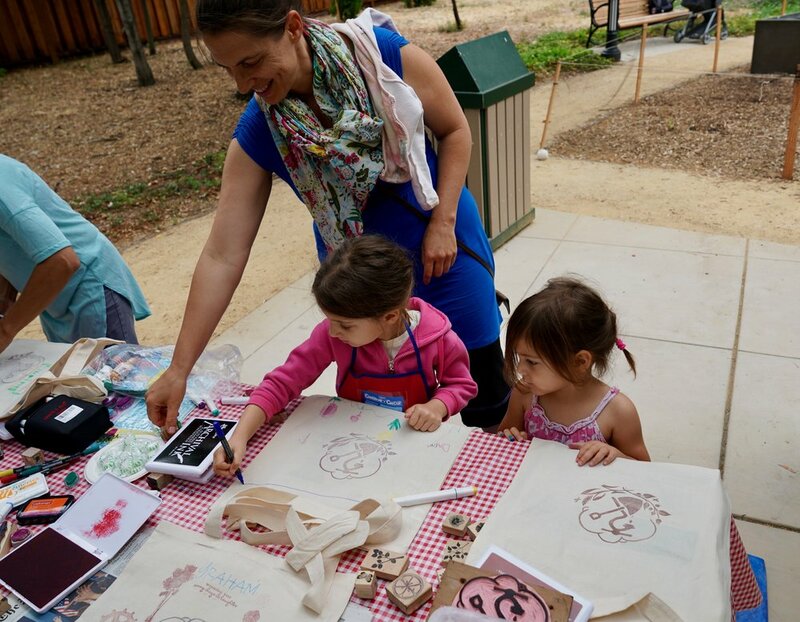 At this hands-on workshop children of all ages will use microscopes and magnifiers to explore the wonders of the hidden garden. 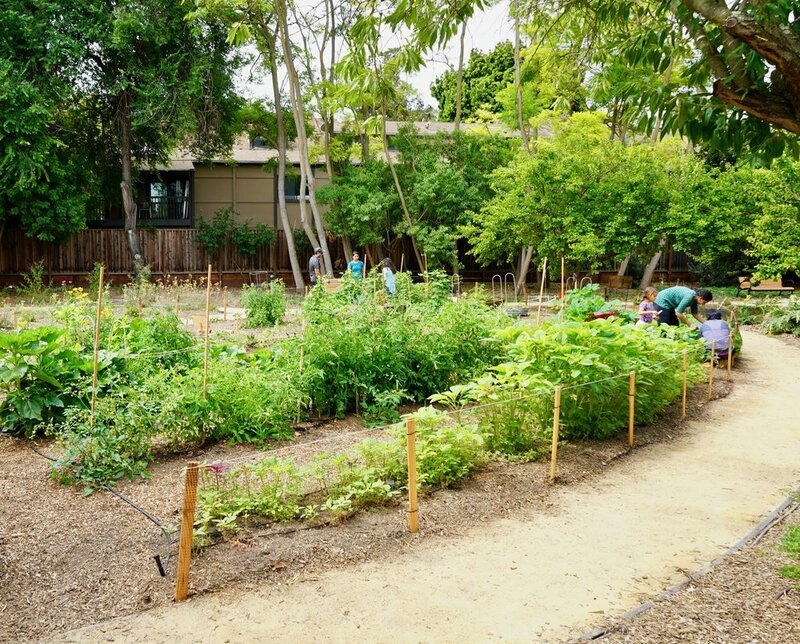 In this fun and educational STEM event kids will transform into Dirt Detectives and take a close-up look at what’s growing in our garden! Our Dirt Detectives will begin with a scavenger hunt then observe the treasures they find under the magnification of microscopes. 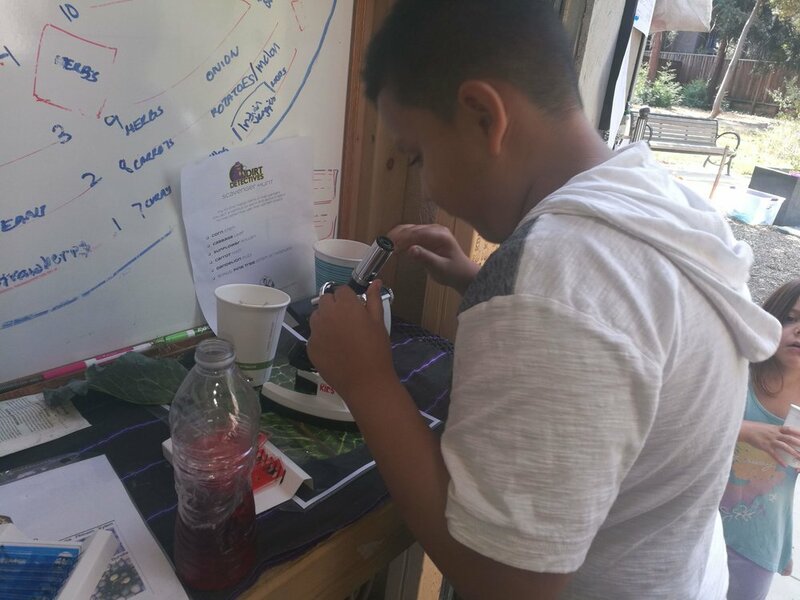 Our Dirt Detectives will learn: how to use a microscope to make observations, how to identify different parts of a plant, and how plants use sunlight, carbon dioxide and water to make food (photosynthesis). 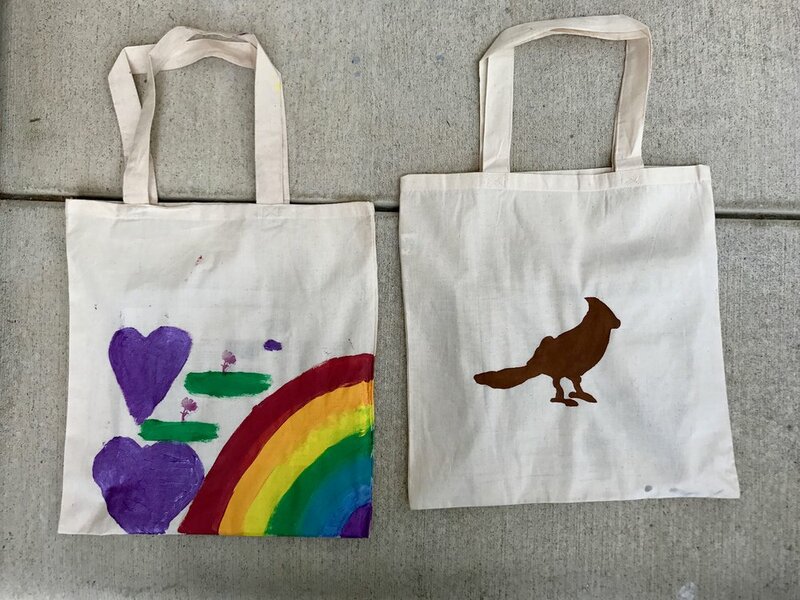 All ages are welcome, and no equipment or registration is required. Come dressed for dirt and don’t forget your hat and water bottle! Squirrels can be a big nuisance (to put it lightly)! We lost most of our tomatoes last year to the resident squirrels so we netted the tomatoes this year. If you've been by the Soil&Water garden lately, you might have seen our stake and netting structure. It helps with the tomatoes but that means they are eating other stuff. We have been excited about our 11+ foot corn. 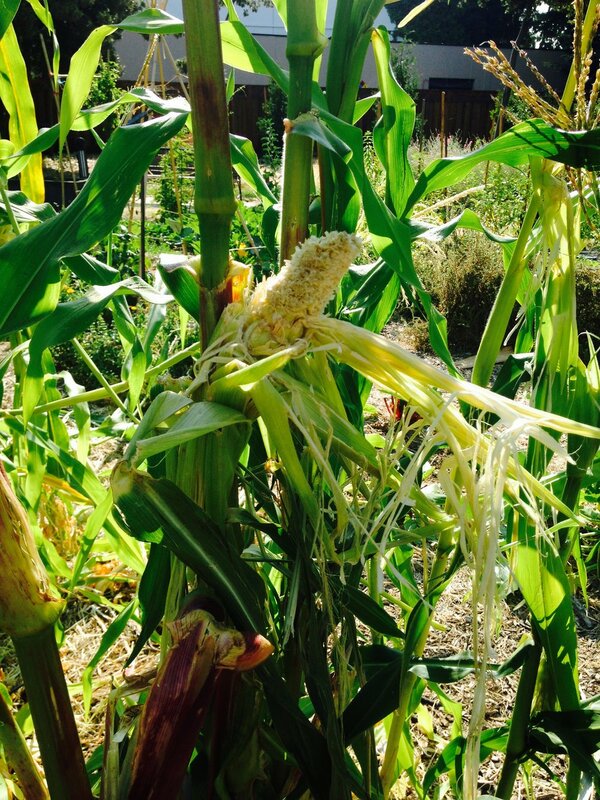 We are growing a variety called Evergreen Sweetcorn, non-GMO white sweet corn, which was given to us by SlowFood USA. The corn was doing really well with several ears on each stalk. 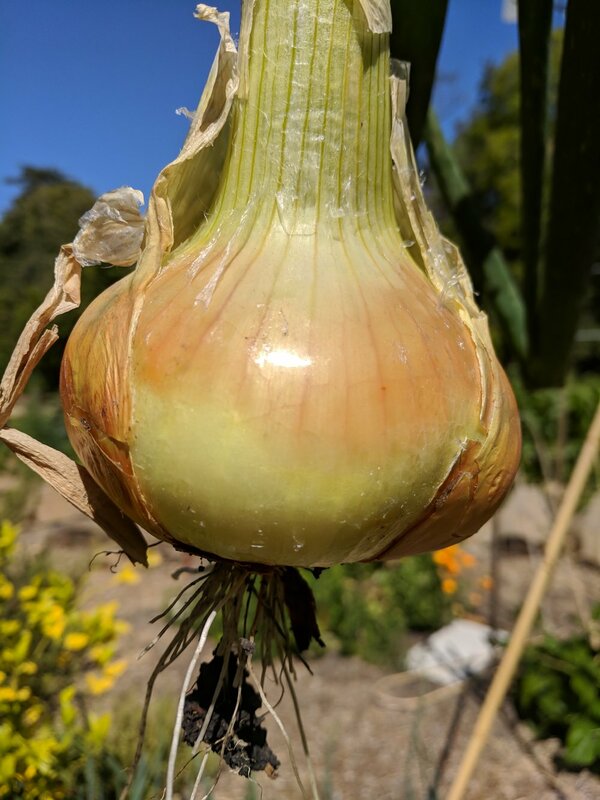 Some gardeners that attended a workday over the past couple weeks were lucky enough to have harvested several ripe ears. We have been waiting for the corn to ripen for a big harvest but the squirrels got to it first! Argh!!! Unfortunately on this past Wednesday, the squirrels ate every ear on 2 full rows of corn. Gardeners arrived on Wednesday morning's workday to find stalks all over the place. Those sturdy stalks providing the climbing structure needed to get to the tasty ears of corn. What could they do but clean it up and harvest what they could. How do squirrels figure out exactly when it is all ripe anyway? By Saturday's workday, the squirrels got it all! Not an ear left in the entire garden! We must have had nearly 100 ears of corn growing only to provide food for those thieves. Sad. This week we harvested (clockwise from top): cabbage, kale, scallions, corn, bell peppers, tomatoes, bitter mellon (indian and chinese), sungold tomatoes, strawberries, squash, green beans, tomatillos, and cucumbers. Photo: Jason O'Grady. Indian chai for many is part of a daily ritual to be enjoyed in the morning with breakfast. It is also a warm treat enjoyed with friends. Served with fresh snacks in the afternoon, it is refreshing and a lovely way to relax. The traditional drink is made with black tea, milk, ginger and spices (like black pepper, cardamom, and clove). It is good for digestion and tea has a lower caffeine content than coffee. It is easy to grow herbs in your garden that make fantastic combinations for chai. In fact, at the Soil&Water garden in Heritage Park, we have planted many herbs that are great for tea. Make sure you harvest some of these herbs next time you join a workday. Basic chai recipe (ginger): Add fresh grated ginger to 1 cup water and boil until you smell an aroma. Add 1-2 teaspoon loose black tea to boiling water. Add 1 cup milk, chai masala (mix of spices) and sugar (optional) to taste. Continue to heat until the milk causes the mixture to rise. Allow the mixture to rise but not overflow the pan 2-3 times and then take off the heat. 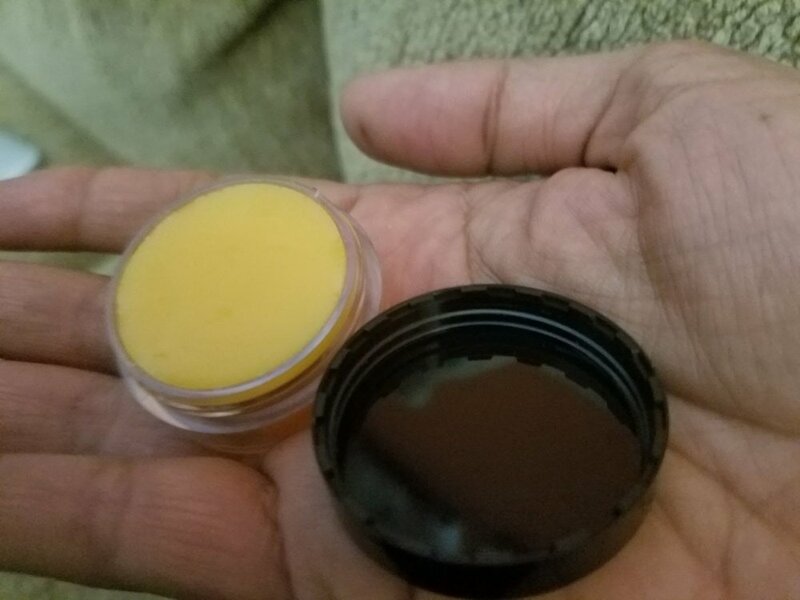 Strain and enjoy. Makes 2 cups. If you don't drink milk, you can add a milk alternative of choice. Almond milk or soy milk work well. Mint chai: Use fresh grated ginger. Use same method as above. Add mint and chai masala (optional) at the same time you add your milk. Cardamom chai: Use same basic chai method as above. Add cardamom (to taste) instead of chai masala at the very end after removing from heat. I like mine with a lot of cardamom! Lemongrass chai: Add fresh lemongrass and grated ginger to 1 cup water and boil until you smell an aroma. Add 1 teaspoon loose black tea to boiling water and 1 cup milk (or milk alternative), and chai masala and continue to heat until the milk causes the mixture to rise. Add sugar to taste. Enjoy! Adds a lemony flavor. 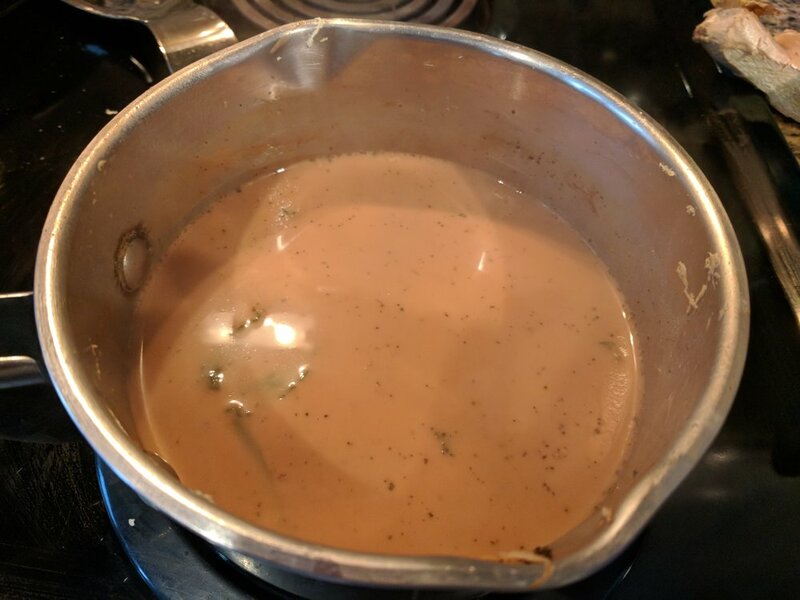 Add 1-2 teaspoon loose black tea to boiling water and 1 cup milk (or milk alternative), and chai masala and continue to heat until the milk causes the mixture to rise. Add sugar to taste. At the garden we are also growing chocolate mint, this herb added to black tea makes a really nice chocolat-y-mint black tea. I personally add this alone without any other flavors since it is a strong flavor alone. Works well as a simple black tea bag steeped in a mug and add the mint to it. What is your favorite chai recipe? Please share so others can try it too. Leave it as a comment below! If you decide to experiment with a flavor combination, I'd love to hear about it. 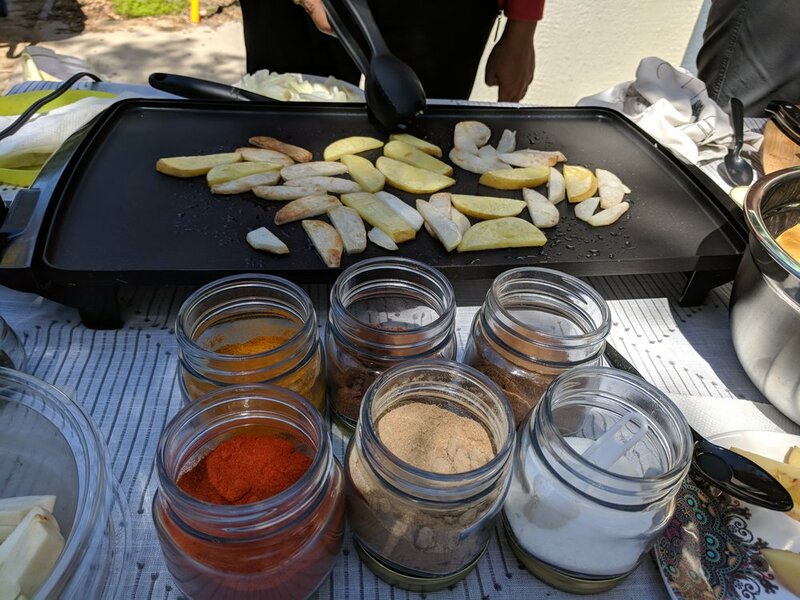 Soil and Water is excited to host it's first 'Cooking Demonstration' at the Garden this Wednesday. Please come to the Garden and watch few gardeners use fresh herbs and vegetables from the garden to create a delicious meal. Come and have fun and taste the food. This is a free event. All are Welcome!. 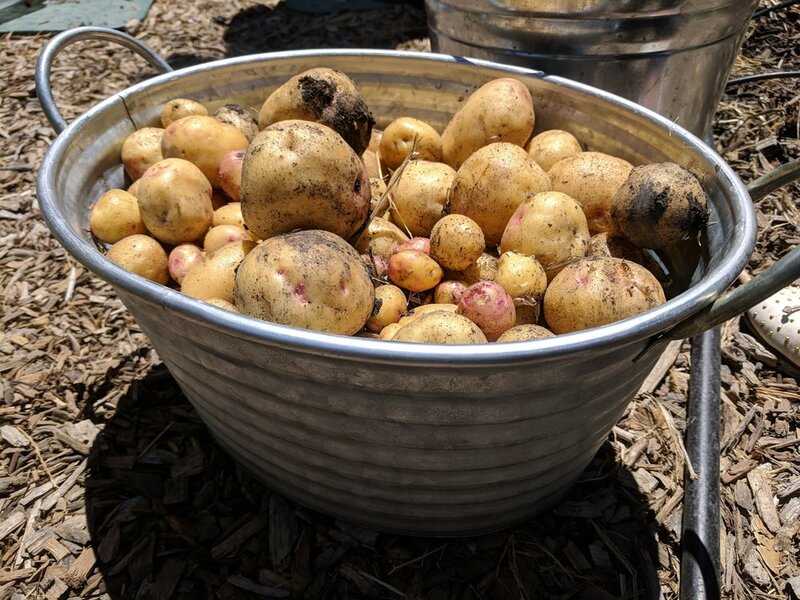 Here are few pictures of the Summer Harvest from our Garden. and more to come..